But first! A primer on what cocoa butter is. A vegetable fat, cocoa butter comes from the same cacao bean we know and love. The beans (largely grown in Africa and South America) are roasted and pressed. The butter that drips off is then used in everything from candy bars to body lotion. WHAT ARE THE COCOA BUTTER BENEFITS FOR SKIN? In the beauty world, trends come and go. But cocoa butter’s skin-loving properties make it a forever staple. Here’s why. It’s the ultimate moisturizer. A natural emollient, cocoa butter moisturizes deep into the skin, so it’s nourished and smooth for hours. 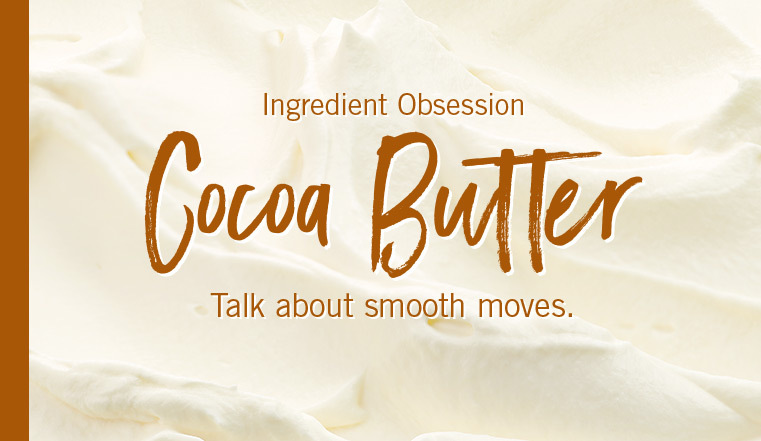 We especially love it in our cocoa butter-infused body creams. It’s a winter-skin essential. Cocoa butter moisturizers are in our year-round skin care rotation. But during the chilly months? Mandatory. That’s because cocoa butter is high in saturated fat, making it great for healing (and defending against) dry, cracked skin. It can help stop the clock. Well, not literally. But antioxidant-rich cocoa butter has been shown to help slow down skin aging, and even firm up skin. It’s sensitive-skin-friendly. Those with eczema or psoriasis may find relief with cocoa butter. It kisses lips with moisture. Buh-bye, chapped lips. It could make those stretch marks vanish. There’s no research to back up this claim, but many women swear by cocoa butter for stretch marks. Word is it can help prevent and repair them.